The youngest brand in Roark Capital’s sprawling restaurant empire is about to test how astutely the investment firm read the market when it bought into the concept, Naf Naf Grill, in 2015. The deal was a marked departure for Roark, which had found considerable success in buying and rejuvenating franchise brands whose growth had been slowed by age. Naf Naf was new (founded in 2009), small (13 units at the time, all in the Chicago area) and 100% company operated. It was the company’s first true growth chain and the closest Roark has come, before or since, to a startup. The falafel and shawarma chain has grown to 38 units in seven states and the District of Columbia. All are company operated, but franchising is set to begin later this year. “The concept is ready to be franchised,” says Paul Damico, who moved over from a president’s post at Focus Brands, Roark’s restaurant-chain operating company, to become CEO of Naf Naf last summer. Among his previous charges were Moe’s Southwest Grill, one of Roark and Focus’ first large assimilations. The concept has been tweaked to fit the fast-casual mold more exactly. The original Naf Naf restaurant was more of a counter-fronted quick-service brand, where customers placed their order at a cashier’s station and then took a seat until they were called to pick up the food. Now patrons move down a line to customize their meal and watch it being assembled, a la the Chipotle model. The shift brought down the previous service time of eight to 10 minutes, according to Damico. The stores have been shrunk to 2,000 square feet, with seating for about 40 people. Considerable effort has gone into capitalizing on the off-premise boom, Damico notes. “We’re considering sites now where there are no seats at all,” he says. A prototype scheduled to open in April in Schaumburg, Ill., will feature a “takeout wall,” a “series of racks for us to take all of the to-go and all of the mobile orders and put them there so customers don’t have to deal with a person,” Damico says. Although Naf Naf is far smaller than any of Roark’s other restaurant holdings, it was put under the tutelage of industry heavyweights. Right after Roark invested in the Chicago upstart, it tapped Gary Beisler, a former CEO of Qdoba, and George Condos, a onetime president and COO of Arby’s, to serve as directors of the brand. Damico comes to the job with 35 years in the business, a good chunk of it spent as president of Moe’s, a pioneer of the fast-casual market. Damico say he’s well aware of the “headwinds” buffeting the fast-growing segment. Part of the challenge is the rapid expansion of the pizza, Mediterranean and burger subsegments. Mediterranean fast-casual concepts often feature falafel and other stuffed pita sandwiches, two staples for Naf Naf. But the chain does not want to get labeled as being part of that market. He notes that Naf Naf bakes its own pitas, builds its own shawarma towers and produces its own falafel mix, using just six ingredients for the latter. 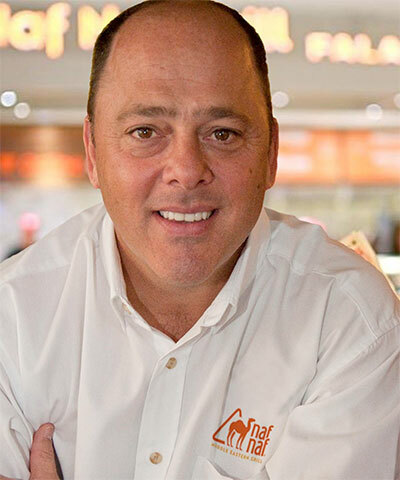 He walked away from a corporate position, overseeing such brands as McAlister’s and Schlotzsky’s, to assume the more entrepreneurial role of leading Naf Naf. Roark's other restaurant investments include Jimmy John's, Culver's, Carl's Jr., Corner Market, Jim 'N Nick's Bar-B-Q, Carvel, Cinnabon and Il Fornaio.